DNX Energy can help you to gain control over your business electricity costs. With electricity prices on the rise in Western Australia, we can help you to mitigate the risk of rising energy bills. Free up cash-flow so you can invest it where it belongs… in your own business. Solar offers an economically viable and clean alternative to fossil fuel powered generation. Generous financial incentives are still in place. Now is the time to start saving – regain control over your electricity spend. Our proposals – easy to understand, yet comprehensive. flexible terms up to 7 years. With a Power Purchase Agreement (PPA), we provide the system at no upfront cost and you simply buy the power the system generates over an agreed time frame. A great benefit to our clients is that electricity rates can be locked in, and operation and maintenance remains the responsibility of DNX Energy. In many cases, we are able to provide you with a lower rate for the solar electricity than what you are currently paying. Our installers are fully licensed, and CEC accredited. After the solar installation we offer performance monitoring and maintenance contracts. This service includes monitoring of the performance of the system with scheduled reports and alerts to protect against under-performance or faults. Optionally, we can provide equipment to monitor the consumption of your premises so you can have a full picture of your energy spend. Our equipment is of the highest quality, reliable, and efficient. All our equipment is listed on the CEC approval list. We are one of the very few companies in Australia who can offer genuine German made solar panels among our selection of tier 1 manufacturers. We will visit you at your business location, answer your questions, and explain the finance options available. Every business is different so it is important to understand your energy use and how a solar system can reduce your cost of electricity. 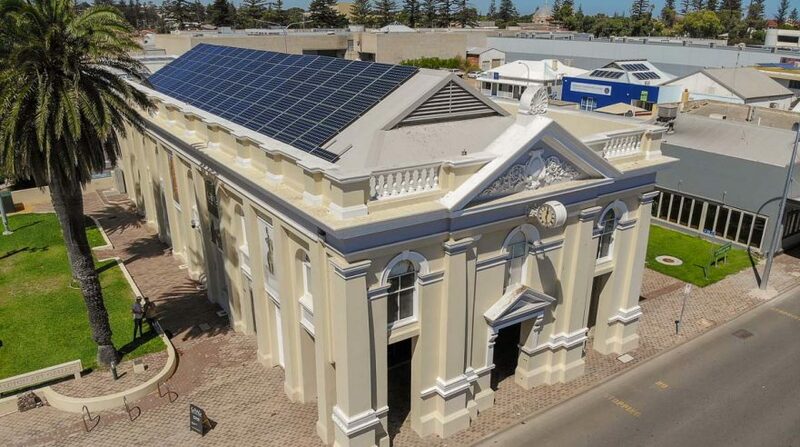 Only a few electricity retailers offer to buy-back excess solar power from commercial customers in Western Australia, so it is crucial to ensure your system complements your energy demand. We analyse your daily electricity consumption profile, the type of equipment and appliances in your organisation, and the electricity tariff you are on. The daily electricity consumption profile shows the time of the day you are using electricity. By going into this detail we can say for certain the amount of energy savings that can be achieved, and it may also show potential for further energy efficiency. We take care of all approvals and schedule an installation date as soon as the system has been approved. Switch on the system and see your electricity cost savings grow in our online monitoring portal (optional). Which industry types are best suited for commercial solar? 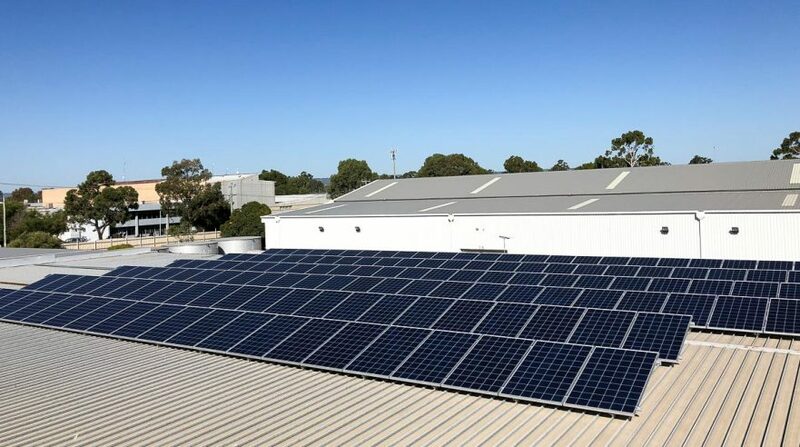 Premises with high daytime electricity consumption such as manufacturing, retail, office, education, wholesale & warehouses and hospitality are best suited for commercial solar installations. With rising energy costs, an investment in energy saving measures can directly contribute to an increase in the value of your business. When a company moves to buy another business, one of the key things they look at is operating costs. One of the biggest costs for any business, apart from staffing, is the amount of energy it uses. By investing in energy efficient equipment and machinery, you immediately reduce the operating expenses of your business and improve your margins. If you ever move to sell your business, this will demonstrate efficient business practices to prospective buyers, and reflect well on your accounts. The costs for battery storage systems are declining steadily. If cost saving is the only motivation to go for battery storage, we recommend commercial clients to wait for the costs to come down further. For now, we recommend to use other means of energy storage such as an electric heat pump to store energy in the form of hot water, decrease the temperature of your cooling system etc. If you are using generators to power your site, a hybrid solar PV system with battery storage is a great choice. Get in touch with us to discuss how we can help you.